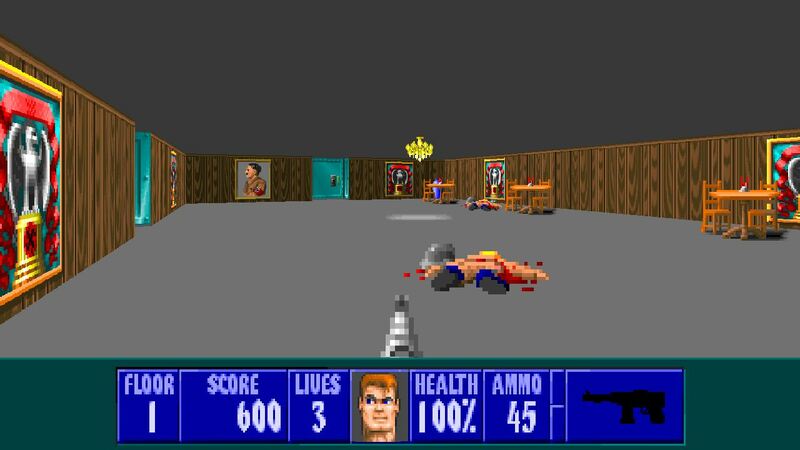 But there are plenty of other reasons for me to recommend playing Wolfenstein 3D (or Spear of Destiny) with ECWolf instead of DOSBox, one of them being that mouse aiming is noticeably smoother, along with being able to disable the Y-axis (moving back and forth with the mouse). Admittedly, aiming with your mouse does make the whole thing somewhat easier since the enemies aren’t the most alert bunch, but don’t forget that it’s optional, mouse aiming was in the original too, and it’s not terribly difficult if played strictly with keyboard controls either. And speaking of keyboard controls, ECWolf adds another useful feature that I do believe wasn’t in first person shooters until Quake hit store shelves in 1996, four years after Wolfenstein 3D: The ability to move sideways, aka. “strafing”. This changes the game more than you might initially think, since it lets you check what lies around corners and quickly move out of harm’s way, but again.. it’s optional. Although the visuals have not been changed from the original, one tiny change has been included, which is something called ‘depth fog’. I’ll admit that the idea itself is nice, but at the same time, there’s definitely room for improvement. It just looks.. out-of-place. Or maybe I’m just being picky? In any case, the developer is working on adding support for more Wolfenstein 3D engine games, such as the Blake Stone series. I wouldn’t recommend that anyone play those games ever again though, but hey.. that’s just my opinion and I’m sure someone out there actually find them enjoyable. Now.. are you ready for some old-school shooting? First of all, you’re going to need ECWolf (here), along with either game. Shareware versions are available here, but for the full games I’d recommend Steam (Wolfenstein 3D and Spear of Destiny), where they’ll set ya back $4.99 a piece. Enjoy the nostalgia trip!